This is Elena K. from Switzerland you will remember me from our previous correspondence. 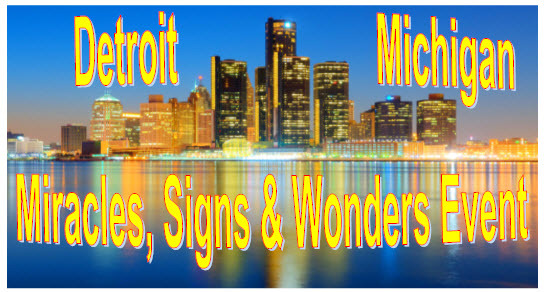 Last time I emailed you before Kevin ministered in Detroit area in August 2018. God supernaturally led me to be in that event, my family members from Michigan, my son were also able to attend this Seers Event. I came from Switzerland to that event and my air ticket was paid for supernaturally from from Quèbec Canada! Isn’t it amazing that Canadians agreed to pay for my extra travel to Detroit Michigan on the way to Quèbec! We praise our God and Lord Jesus for everything! We truly experienced the Presence of God during those 3 days of meetings n Detroit and I am sure, each of us received a greater measure of the anointing from the Holy Spirit! My sister-in-law’s sister J. received a healing miracle when Kevin called her out prophetically from the audience and prayed for her deaf ears to open! Her deafness was healed at that moment! She got healed and started to hear clearly! Praise the Lord! Hallelujah! Kevin also spoke prophetically over another person from our group and prayed for the gift of discerning of spirits to her to be activated in her life. We knew that God was doing it, for the word Kevin gave to her was so very accurate for that particular time in her life. It really encouraged and helped her greatly. I spent beautiful time of experiencing and worshiping the Lord with the congregation of that church, I just couldn’t stop worshiping!. During the healing ministry a woman from the prayer team ( God highlighted her to me) prayed for me : concerning strong headaches that I’d had more and more often… Her prayer was so powerful in tongues and in words for the Power of God was present! - I really felt the power and touch of God hit me and I believe to have received the healing. I have hardly had any symptoms of those headaches since that prayer! Thank You Jesus! Kevin and Pastor Hudson of that church anointed all of us with oil imparting the gifts of the Holy Spirit and I believe to have received the impartation, Hallelujah! Since those meetings I see signs and wonders of God in my life consistently as I seek His Kingdom and feel like my life is becoming a beautiful story of the love of God! It’s precious, I am sure you can relate to that. So, I wanted to share this praise report with you, your ministry. When I met Kevin personally and found him to be a humble man of God, which was very nice. You could see that he sees everything through the eyes of God and gives credit only to Him. We had a short conversation with Kevin, there were others waiting for him, so I was not able to tell him my whole testimony how God used him, and his books, especially; the 31 Word Decree in my life. That book has really changed my life! I wanted to let you know and to testify that I truly received revelation and impartation of God’s word and anointing of the Holy Spirit through King of Glory Ministry International. Of course, we give all the Glory and praise to our God! I just want to encourage you and to let you all to know how lives of people like me are touched and transformed by God through the work that the ministry and Kevin and his team release the glory of God and minister for His Kingdom! I want to say thank you! Kevin also spoke a father’s blessing and Luke 2:52 over my son. My son needs a creative miracle in his wrist growth (his natural height) and straitening of his forearm and wrist (the former dislocation was caused by the injury). So we believe that these miracles will be manifested! Kevin took Philipp’s player card and said that he would like to know how it’d be going with him, so we spoke that we could give Kevin feedbacks through Christine (I told Kevin that I had contacted you before). Please know that God has been doing amazing things in Philipp’s life, and our whole family and others around us are being touched by the power of God and the anointing of the Holy Spirit in Detroit. God’s grace and favor is evident upon my son and this is really amazing! It’s tangible and we were all in awe of what God was doing in our lives! We totally trust God in everything and pray continuously! Thank you all! To God be all of the glory!